Following talks in Gaza City on Tuesday evening between officials of the Palestinian Liberation Organization (PLO) and Hamas, an agreement was reached to merge both governments. Talks are expected to continue throughout Wednesday. The announcement to form a unity government between the rival two Palestinian groups is not the first. In 2011, Fatah, the main faction in the PLO, signed a reconciliation treaty with Hamas in Cairo whose purpose was to end the political divide between Gaza and the West Bank. However, little has been done to implement the treaties. 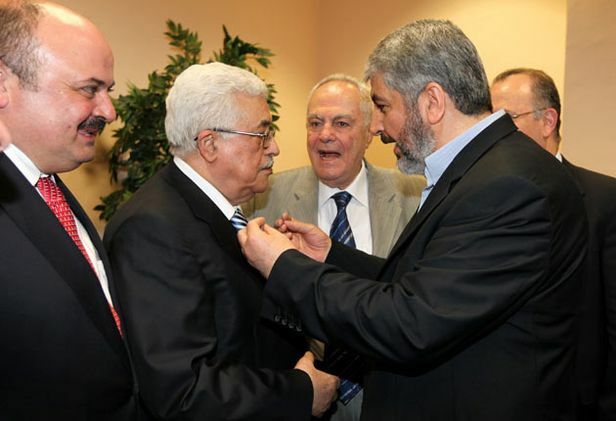 Azzam al-Ahmad, a senior Palestinian Authority official, led the Fatah team, who met with Hamas Prime Minister Ismail Haniyeah and Hamas deputy leader Mussa Abu Marzuq. The news of the latest alliance comes at a time when US brokered peace talks between Israel and the Palestinians face total collapse. With the deadline for the latest round of negotiations fast approaching, mediators on all sides are working around the clock to meet some sort of middle ground to extend talks. Abbas, who threatened this week that he would dissolve the PA government and its security apparatus, laid out new demands for continuing talks with Israel. The Palestinian leader said that Israel must release the fourth batch of Palestinian terrorists, including Israeli-Arabs; freeze all construction in Judea and Samaria; and that within the first three months of extended talks, the issue of borders of a future Palestinian state will be discussed. Hamas is a vocal opponent of the peace process and has publicly stated it would never make peace with Israel.